Home / GST-Tally / TallyERP.9 Lessons / How to Record Cash Expenses under GST in Tally (Reverse Charge)? 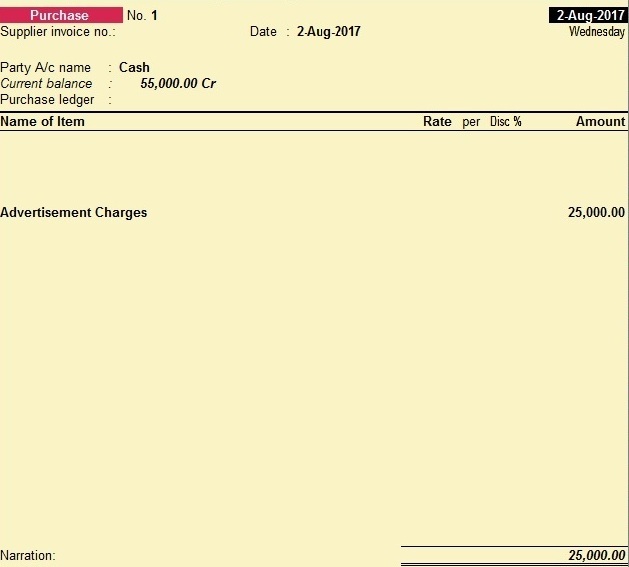 How to Record Cash Expenses under GST in Tally (Reverse Charge)? This is the biggest question of Tally users that how to treat Cash Expenses under reverse Charge in Tally? This question is also raised by our facebook fans, whatsapp group members and our online viewers. We also contact to Tally about this issue and the problem is resolved by Tally by return mail. As per Tally representative, to Create Expenses (Under Reverse Charge) you have to create Expenses through purchase voucher. But before this you have to configure your expenses ledger for reverse charge mechanism. Alter your expenses ledger, Select applicable on GST and set alter to Yes. Now Press F12 for configuration and select yes to Reverse Charge applicable (as below image). Press Enter or Ctrl + A to save the voucher. 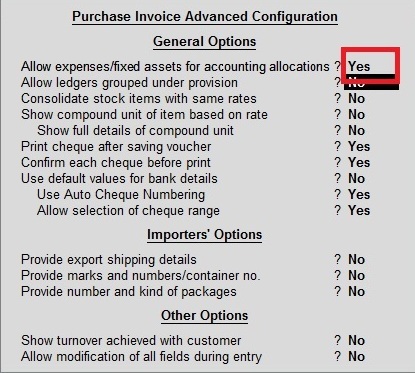 This option allow you to Enter expenses ledger in purchase voucher. Now create a purchase entry with expenses under Reverse Charge. Before save the entry Press Alt + A for tax analysis, you can see there is automatic calculation of CGST and SGST will be made by system but not showing as ledger level. Press Enter to save the voucher entry. 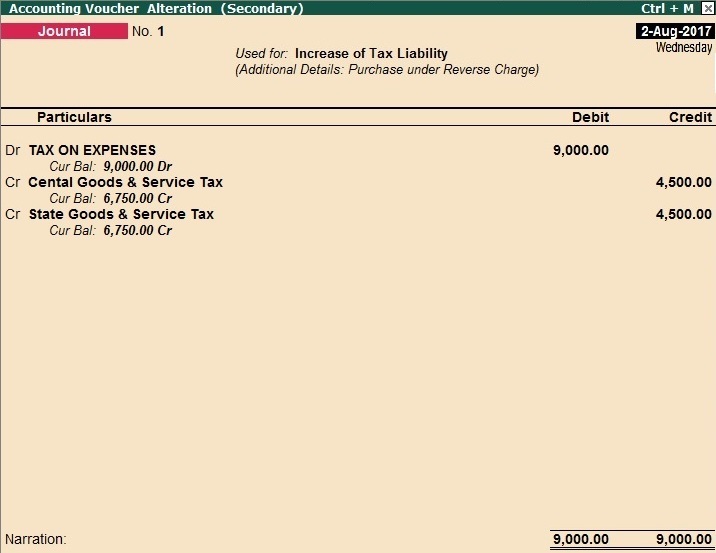 Now create a journal voucher and press Alt + J for Statutory Adjustment of Taxes. Create another ledger named "Tax on Expenses" under current assets. Press Enter to Save the Voucher. This journal voucher create your actual tax liability generated for Reverse Charge. Now make a payment voucher to pay this liability. Go to Gateway of Tally - Accounting Voucher - Payment (F5). Press Alt + S or click on stat payment on right side status bar for make the statutory payment. Select GST, specified period for which you have to make the payment, Select recipient liability (recipient liability will set off the liability of reverse charge). 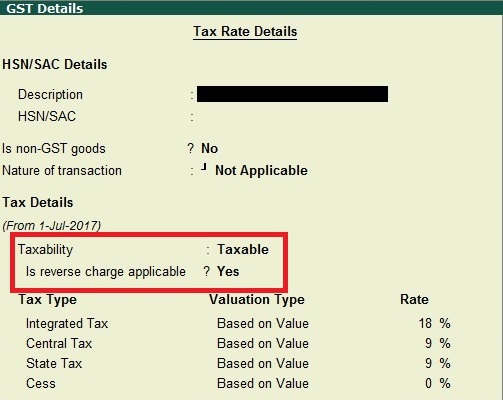 Remember if you pay under Reverse Charge you must have enable option for Nature of Transaction and also Enable Reverse Charge applicability on Expenses. BUT HOW TO BOOK AN UNREGISTERED INVOICE, THROUGH A SINGLE EXPENSE LEDGER, WHICH HAS MORE THAN ONE HSN/SAC CODES AND HENCE DIFFERENT GST RATES ? DO YOU WANT TO BOOK PURCHASE RECORD FROM UNREGISTERED DEALER?